Sometimes the most satisfying meals come when you're not really expecting them. 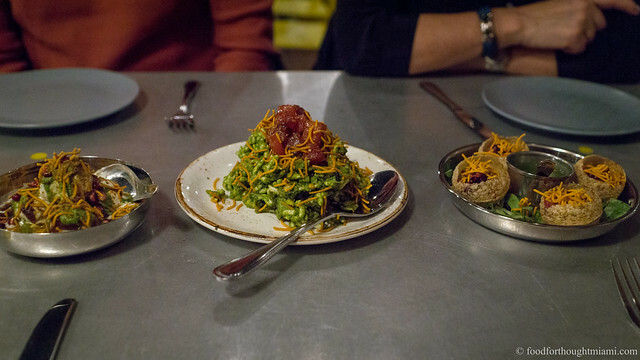 I must have read about Cuines Santa Caterina before we left for Spain, but recall being leery at best - though I liked the idea of a restaurant tied to a market, I was wary of the menu description, which sounded like an unfocused hodge-podge of cuisines. 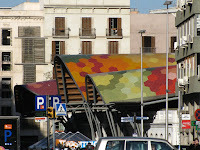 But the afternoon before we left Barcelona, I found myself drawn to the market's multi-colored roof. Unfortunately, the market itself was closed, but its restaurant, Cuines Santa Caterina, was open and hopping. Though it didn't look like much from the outside, the restaurant was deceptively large. The front holds a rectangular tapas bar with seating on all sides for a total of about 25 people, but the restaurant space stretches way back, with several different stations (a cold station for salads, a sushi station, and an open kitchen that seemed nearly half the length of a football field), with counter seating along the cooking stations and a combination of communal and regular tables throughout the rest of the room. Over the open kitchen, a huge display scrolls items from the menu in red LED lights, like a train-station departure list. The menu was laid out as a grid, with the top of the page listing basic ingredient categories horizontally ("vegetables / rice / fish / meat / egg") and the left side listing different preparation styles ("vegetarian / mediterranean / oriental / grilled"). Then within the grid were the various menu items, organized both by primary ingredient and prep style. A little confusing at first, but after a little while it started to make sense. 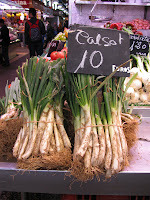 I was very excited to see calçots on the menu, after having just seen them in the stalls at the nearby Boqueria market. Calçots are a Catalan thing, wherein they take a white onion bulb, replant it, and then cover the shoots with earth as they grow from the bulb, yielding tender, sweet, leek-shaped onions. They were flame-roasted until completely blackened on the outside, and served steaming hot on a terra-cotta shingle. Eating them is a messy, finger-searing business, which requires pulling down the blackened outer layers of the calçot to reveal the tender white steaming center, which is dipped in romesco sauce and then eaten sword-swallower style, often involving some quite inelegant contortions. These were fresh, sweet, and absolutely delicious, simply the best onions I've ever had. While I blackened my fingers and twisted around dangling onions over my head, Mrs. F had an appetizer of a a provoleta, a dish of grilled provolone cheese that I've always associated with Argentina. Here, it was served bubbling hot in a cazuela, topped with a dice of tomato and a nice, pungently herbal and garlicky pesto. Very good and almost too much food for an appetizer. She followed with some delicious grilled baby calamares, served with shaved asparagus and a dribble of sauce of the squid's ink. I had a very nice rice dish, made to order and served in a cast iron pan, with wild mushrooms, butifarra sausage, morcilla, and chicken. The rice was permeated throughout with the aroma of the mushrooms, and had nice crispy bits around the edges. I had low expectations and they were vastly exceeded, indeed everything we had was just great. I have no idea if everything on the ambitious menu is of the same quality, but after our experience, I'd be willing to try. Thanks for sending me the link to your blog. Wish you'd started this last summer. My wife and I vacationed on the Southeast coast of Spain (Albir, Altea, Alicante) then spent 4 days in Barcelona. We loved Barcelona for the sightseeing and the beach. The food, not so much. Anyhow, keep on blogging. Love your writing style and the foodie tips esp. in Miami.